Leaving Venice our next stop was the legendary city of ‘Roma’. Everyone knows something about the magnificence of Rome and the Roman Empire, it is ‘shown off’ in movies filled with action, adventure and romance, depicted in books and taught at schools all over the world. So it comes with no surprise that Rome is one of the worlds most iconic and ‘bucket-listed’ cities in the world. Rome, once the hub of a legendary Empire is now known for its history meets modern city landscape, fashion, religion and of course food. We were here to explore it all – okay, maybe not the fashion part, but window shopping counts, right? After the shambles of messing up our train reservation – which was 100% my fault, fyi there are two big train stations in Venice – we were ‘zooming’ our way to Rome, (with a quick stop in florence along the way) this is definitely the way to travel, the scenery was gorgeous and it only took a couple of hours on the fast train. Arriving into Rome’s main train station we then transferred to a smaller – more like ‘battered tin can’ styled – train to the area our – hostel or hotel, I’m not sure – accommodation in Rome was located. We were spending 5 Nights in Rome, at Plus Camping Roma it was roasting and the walk from the train station to the ‘accommodation’ was exhausting. But at least we were rewarded with (finally) a pool! The ‘hostel’ itself was gorgeous and so cute. It was our ‘budget’ accommodation for Rome, saying this, we did get our own little – tiny – bungalow, which was a pleasant change of pace from the 16 bed dorm room. Plus Camping is also used as a stopping point for Topdeck/Busabout tours so everyone was around our age and the bar was always lively, which was fantastic – but maybe not so fantastic for those looking for quiet. The staff here were super friendly – and patient, the amount of times we ‘broke’ the pool tables and asked for help.. they knew us by name is all I can say – and the hostel had a shuttle bus which would run you into town from site. This was a small fee, only about €3 per person, bargain! We wanted to do as much as we could in Rome while we were here, but we also wanted to have (at least) a day relaxing by the pool – I mean, come on who doesn’t love a lazy tanning day? – so we made sure to figure out the best way of getting to see everything we wanted, as easily as possible. It’s okay to act like a total stereotypical tourist. One of the best things we did in Rome; buying day passes for the ‘Sightseeing Roma Hop on/Hop off bus’. This may go against everything I normally do while travelling (and is every travellers worst nightmare), but, it is so much cheaper and easier! You are given a map with the route loops, they take you past all the main sights of Rome you will want to see and you can hop off and spend as much time as you want at each stop before hopping back on. Thankfully there is no ‘guide’ on the bus. Instead, there are headphones you plug-in to your armrest – kinda like an aeroplane – and listen to the information as you drive past. Just prepare to be cooked. Whether you sit upstairs (open top) or downstairs you are going to cook in the summer heat of Rome. The moving breeze isn’t much help and if you stay on too long, you soon envy those walking. When in Rome, Walk as much as you can. Now, to completely contradict my last post. Walk as much as you can, where you can. If I haven’t already won you over on the ‘you will cook on a bus’ statement, imagine the things you are missing as you drive past? Wandering the streets finding hidden Gelato shops, Art shops or simply enjoying the hustle and bustle of Romes busy town. Theres nothing like exploring while catching some rays – and walking off the pizza. Get to the Vatican Early. Like, as early as you can manage. The Vatican City is beautiful, one of the most impressive, beautiful, overwhelming and intimidating places I have ever visited. Walking up to the Vatican you are met with walls so high it appears as a fortress rather than a holy city. People flock here from all over the world. Lining up to experience the history, the religious history and religion itself, the art, the architecture and just pure curiosity brought on by ‘horror movie conspiracies’ and the possibility of hidden secrets. Getting to the Vatican Early, means avoiding crowds like we experienced. It’s not just ‘crowded’ it is compacted and you almost appear to be ‘herded’ like cattle through the corridors of the Vatican. But even though there were crowds of people and it was completely roasting hot – and I had really terrible blisters – the Vatican City was amazing to experience whether you are religious or not. It has wonderful history from all cultures and some of the most beautiful artwork and of course, the very special Michelangelo’s Ceiling. It’s easy to lose yourself in thought walking along the endless corridors and rooms. Step back in time inside the Colosseum. Are you a spectator, or a fighter? The trademark image that ‘Rome’ conjures in your head is always the mighty Colosseum. Once, a spectacular form of entertainment for the wealthy and punishment for the poor is now one of the most visited, bucket-listed and Movie promoted places in the world. Give yourself plenty of time at the Colosseum, it is not something easily rushed round – not that you would want to anyway, right? – it is too easy to get sucked into your imagination, staring out over the excavated underground holding cells of the fighters, looking up at the spectator stands, climbing to the highest point imagining what people hundreds of years ago were witnessing – and taking the perfect ‘Colosseum selfie’ (yes, we have all done this). Once you have wandered around the Colosseum and tired yourself out – I mean, not that you could get tired of wandering the Ancient corridors of the Colosseum – head on over to the Roman Forum. Go to the Colosseum first, or give yourself a few hours window from entering the Roman Forums. Contrary to what your ticket says, you do not get multiple day entry into the Roman Forum, you can only go in once and if you haven’t left a lot of time before your Colosseum entry ticket time, you will miss a lot. The Roman Forum is an area surrounded by ruins of many important Ancient ‘Government’ buildings located in the centre of Rome. The ruins are presented over a large area, winding with walkways and shortcuts that soon get you completely lost within the Forums – but in a ‘good way’ lost. – allowing you to fully explore and discover eery and wondrous sites. Finding the ‘exit’ of the Forums is harder and unclear, this is why you want to have enough time. Trust me. You do not want to be running around in the midday heat, trying to find your way out and over to the Colosseum. The beautiful, romantic masterpiece hidden away up Rome’s cobbled streets won’t leave you disappointed, unless you travel before the end of 2015. Sadly the Trevi Fountain is under ‘cleaning and renovation’ work, so the fountain itself is not on, there is no water in the pool and it is ‘buried’ by scaffolding. At least we know it will be unveiled at the end of the year in all it’s beauty. Many tours in Rome are not advertising this so many people – like we were – are completely oblivious to the renovations and it can be quite disappointing when you turn up and only have the option of throwing a coin into a bucket – yes, a bucket. 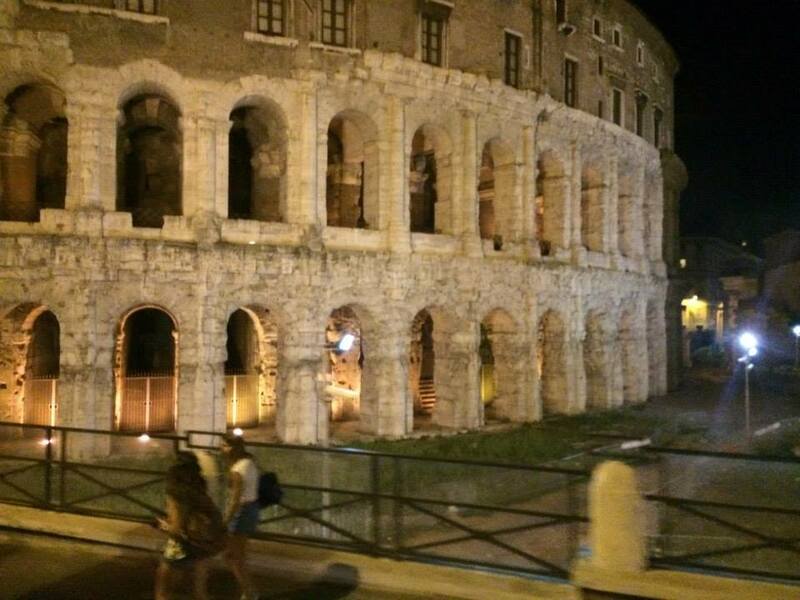 Wander Rome’s Streets at Night and visit the spectacular wonders of Rome beautifully lit up. On one of our last nights, we signed up for a walking tour of Rome after dark. While the idea of following a guide with a flagpole was my idea of a nightmare – and it was pretty cringe – but she was really informative and there is no way we could have seen the Pantheon, Colosseum, Trevi Fountain, Romes beautiful Side streets, Roman Forums and so much more lit up beautifully at night. Rome has so much to offer and was probably my favourite part of our Italy adventure, – mainly cause I got to walk off a lot of the pizza, and sunbathe by the pool – the people in Rome were so friendly (and flirty) the food was amazing, the weather beautiful and there was always something to do or see. We spent 5 Nights in Rome and we still didn’t manage to do all we wanted to – because we ran out of money, oops – with the right amount of planning, or infinite amount of time, you could spend a long time in and around Rome. If you are planning on travelling to Italy, my tips are; take enough money, go to Pompeii (I’m so sad we couldn’t go), do the night tour, find a hotel with a pool and eat loads of Pizza and Ice Cream! Best hotel deals and save up to 70% off ALL ROOMS in ROME.Italy. writing. I’ve had a difficult time clearing my thoughts in getting my thoughts out there.